Prof. Partha Dasgupta has been appointed to lead a UK government review into the link between biodiversity and economic growth. The UK Chancellor of the Exchequer's Spring Statement outlined the estimated £680 million value that 1,500 species of pollinators deliver to the UK economy, highlighting that climate change is not the only environmental challenge. 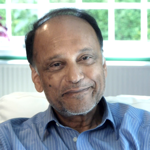 Professor Sir Partha Dasgupta is an Emeritus Professor of Economics and Chair of the Management Board of the Centre for the Study of Existential Risk.